"This great book is first of all fun to read. Dr. Tom has a casual, easy-to-read style and a good sense of humor. Secondly, it has everything you ever wanted to know about your teeth, their care and feeding. 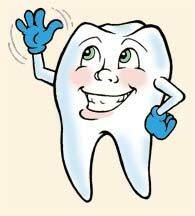 Healthy Teeth - Healthy Body is undoubtedly the best book ever written on preventive dental care." is even better and should be in every home." "I kept wanting to jump up and brush my teeth every five minutes as I was reading it." know to have healthy teeth and gums." this is surely one of the most needed, and potentially, one of the most useful." rare good humor, is followed." so everyone can understand it." gums for a lifetime, in an easy-to-read style." "Makes reading about tooth and gum care not only painless but amusing." fast-buck handbooks . . . It is useful and valuable and ought to be in all homes." informative and easy to read." having two books in one." culture's growing stake in health and fitness." "A light, even hilarious tone pervades the work, yet it's deadly serious. Cartoons...are pertinent and confirmatory. The joint product could start a dental revolution. It's about time." "Anyone who follows McGuire's path to prevention will find himself well into a wellness regimen of nutritional awareness." gums . . . it is a manual of preventive dentistry you can learn at home...the price of the book is a mere pittance compared with the holes in your pocket that have been burned by the holes in your teeth." informative makes this a book you can really get your teeth into."